Its simply a magic, the bastions envelops a whole townships that consist of palace complex various security sources and the havelis of rich merchants carved with an incredibly light touch, several temples and the residential complexes of the armies and traders placed strategically on the trade route, from where the ancient caravans passed en-route passing all the riches for the prosperity to an otherwise non source full kingdom. The golden - yellow sandstone of Jaisalmer Fort, over 800 years old, crowns the Trikuta Hill. Within its walls, defended by 99 turrets, lies the old city, nearly a quarter of modern Jaisalmer. Seen from outside, the sight must be almost identical to what was seen by merchants on their overland camel caravans to central Asia. 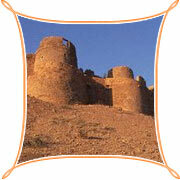 Once this desert outpost was an important gate for the trade route, and Jaisalmer grew wealthy on the proceeds. But the advent of commercial shipping relegated the town to relative obscurity. The colourful art forms and some how side kind the royal heritage and made it appear more pale in comparison . The craftsmen were usually muslims who were induced on their journey to exhibit their skills. The results was architectural purity that cannot be seen elsewhere. Deep in the heart of the Thar Desert is Jaisalmer, one of the last princely bastions in the region. Founded on what was the cross - road of lucrative trade routes, this remote settlement came to be celebrated for the valour of its rulers, and for the aesthetic sense represented by their palaces and havelis.